*A quick disclaimer before we delve deep into the low impact movement – I am in no way the biggest expert on this particular topic nor am I one of the founders of the movement. I simply wanted to use this platform to introduce some of you to this exciting young movement and hopefully get you inspired to take part yourself! I first came across the Low Impact Movement thanks to the prominent UK YouTuber – Sustainably Vegan. In her Ditching Zero Waste video she explains her discomfort about using the term 'Zero Waste' and her switch to the term 'Low Impact'. It felt instantly as if this was something that many of us felt before, but didn't have the right words to express it. Right now I see the Low Impact Movement as an educational movement that focuses on ways to spread awareness both online and offline, but most importantly - it celebrates EVERY LITTLE STEP. My low impact way of bringing packed lunch to work: every little thing helps so even if this means prepping your lunch instead of getting one wrapped in plastic just once a week, it’s still worth it! It's impossible to provide the perfectly well-rounded overview of such an important movement in one blog post, so I thought including a few practical, easy tips would be a great way to show just how simple it is to get involved. No, you don't need a trash jar and you don't need to be a minimalist living out of your backpack to take part. What I love about this movement is its all-encompassing, inclusive approach that focuses on the GOOD. When talking about trash, environmental destruction, and plastic pollution it might feel virtually impossible to focus on the good, but there are so many ways we can get involved and really make a difference. FUN IT UP WITH CHALLENGES: Set yourself some fun challenges or, even better, find a ‘low impact’ partner to do them with – try cleaning your flat without using paper towels or disposable wipes for once, try groceries shopping with no or minimal plastic packaging, try walking/cycling/taking public transport to work instead of driving, etc. GET INSPIRED: It could start with something as simple as watching a few Netflix documentaries (just search for Environment/Plastic/Ocean) and discussing them with your friends. Or you could start your own personal online or offline blog where you write down your thoughts and inspirations for a low impact lifestyle. 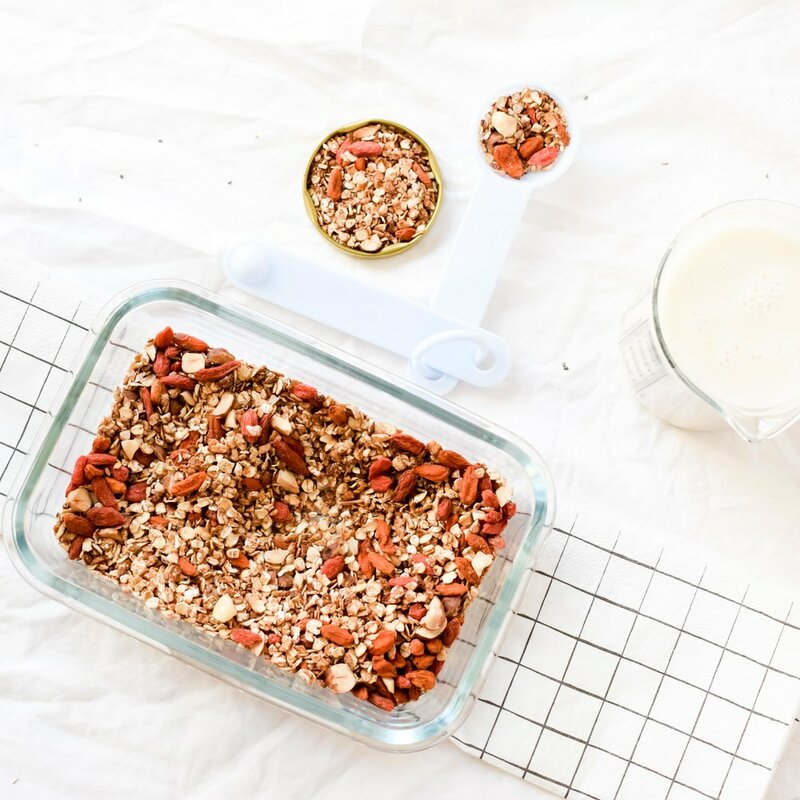 Make your own: find a designated day of the month to do some batch cooking or baking: I like to make my own granola, energy balls or plant-based mylk. Best Resources and How to Get Involved? Whether you're into 30-day challenges, longer educational material, inspiring photography or quick tips while scrolling through your Insta feed – there's something for everyone. I collected some of my absolute favourite materials that helped me on my low impact path and were of immeasurable value when it comes to understanding the movement and implementing it into my daily routine. FREE GUIDE: Download the entirely free Low Impact 30 Challenge Guide here. INSTAGRAM: The no.1 resource for your daily low impact inspo would certainly be @thelowimpactmovement – don't forget to also check out #thelowimpactmovement and get involved with the community. Some other amazing Instagrammers would be @blueollis, @madeleineolivia, @our.planet.our.home and @beatlebel. YOUTUBE: Check out the following channels: Sustainably Vegan, Living the Life You Love, Shelbizleee and Emma Ross. OFFLINE: This Changes Everything by Naomi Klein is a fantastic resource for all book lovers and an absolutely essential read for everyone wanting to delve a little bit deeper into the world of sustainability and environmentalism. Another great read is What We’re Fighting For Now is Each Other by Wen Stephenson. This article was written by Tajda, who is the founder of My Vegan Minimalist. She writes about sustainable living and captures her daily vegan adventures on Instagram.